The black 8x25 TravelView Binocular from Meade is a light and compact binocular that fits perfectly in a pack, bag, or pocket for quick glassing on the go. Anti-reflection multicoated optics maximise the amount of light that gets to the user's eyes for bright and clear images. Twist-up eyecups allow for custom eye relief with or without eye wear. With the cups all of the way out, the eye relief is 0.5". This binocular features an aluminium alloy housing that is covered with a textured rubberized armour to protect it from drops and impacts while providing a non-slip grip. The TravelView is compact enough to be used one-handed, and the 9-ounce weight won't tire most people's arms for longer viewing sessions. The black 10x25 TravelView Binocular from Meade is a light and compact binocular that fits perfectly in a pack, bag, or pocket for quick glassing on the go. Anti-reflection multicoated optics maximise the amount of light that gets to the user's eyes for bright and clear images. Twist-up eyecups allow for custom eye relief with or without eye wear. With the cups all of the way out, the eye relief is 0.4". This binocular features an aluminium alloy housing that is covered with a textured rubberized armour to protect it from drops and impacts while providing a non-slip grip. The TravelView is compact enough to be used one-handed, and the 9-ounce weight won't tire most people's arms for longer viewing sessions. 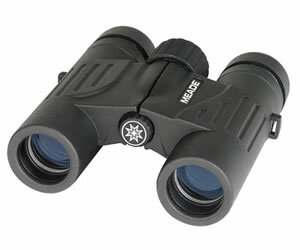 The black7x50 TravelView Binocular from Meade features large objectives and a porro prism optical design that offer bright and clear views with a rich depth of field not normally seen in comparable roof prim binoculars. Complementing the objectives and prism configuration are anti-reflection multicoated optics that maximise the light coming into the user's eyes. Its aluminium housing is covered in a rubberized armour to help protect it from drops and impacts, while the fold-down rubber eyecups make it comfortable to use with or without eye wear. Since the large objectives add weight to the binocular, it can be mounted on tripod using an optional adapter for long glassing sessions. 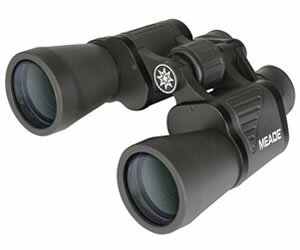 The black 10x50 TravelView Binocular from Meade features large objectives and a porro prism optical design that offer bright and clear views with a rich depth of field not normally seen in comparable roof prim binoculars. Complementing the objectives and prism configuration are anti-reflection multicoated optics that maximise the light coming into the user's eyes. Its aluminium housing is covered in a rubberized armour to help protect it from drops and impacts, while the fold-down rubber eyecups make it comfortable to use with or without eye wear. Since the large objectives add weight to the binocular, it can be mounted on tripod using an optional adapter for long glassing sessions.